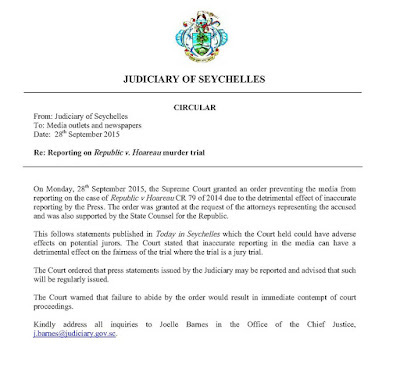 Today in Seychelles can no longer write about the Damienne Morel murder. Chief Justice Mathilda Twomey who will hear the murder case, issued an order that was served on the editor of the newspaper a few hours ago, prohibiting the newspaper from writing about the court proceedings without the court's order. The request for a gagging order was made by defence attorney Anthony Juliette. Juliette later tried to intimidate the daughters of late Damienne Morel outside the courtroom. He was talking to his client - Damienne's former husband and father of her two daughters - together with his family members when one of them asked the lawyer not to be too loud for fear the daughters would hear. Juliette then started swearing at them. Among them were four witnesses to the case.